Kyiv (Kiev) Travel Guide. Golden Gate. 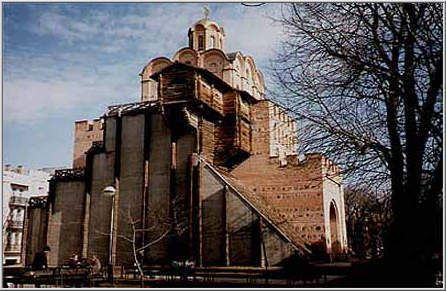 The gate, destroyed during Batyi Khan's invasion was not reconstructed, but travellers who visited Kyiv in the 16th-17th centuries left descriptions and sketches of the ruins with the remains of the church. A century later what remained of the gate was levelled to the ground, and it was only in 1832 that archaeologists unearthed it, and it became a sensation. The gate was put in order, reinforced and opened to view. Its picturesque ruins could be seen up until recently. For the preparations for the celebration of Kyiv's 1500th anniversary a group of specialists reconstructed it in its original for-the way it looked nearly a millennium ago. In 1983 the Golden Gate became a museum.